There is a secret restaurant in Disneyland. It’s not on any map, but it exists just the same. 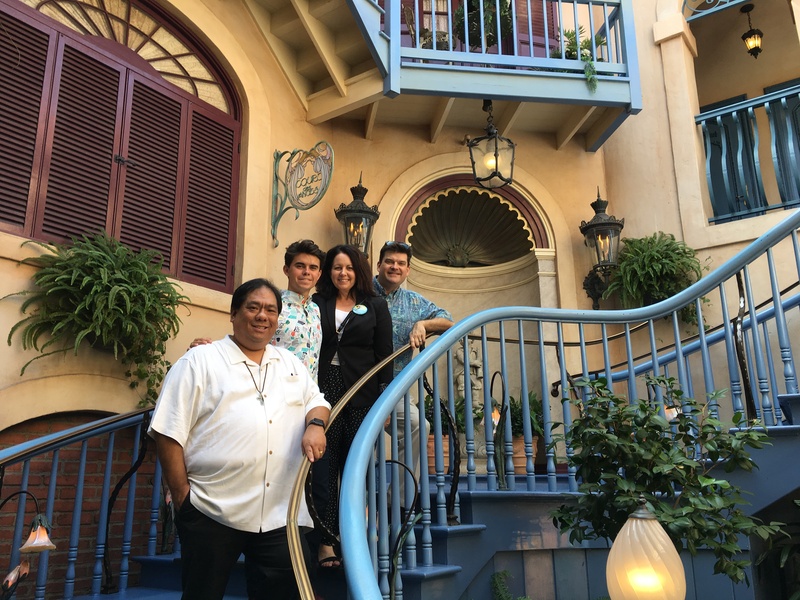 Club 33 is a members-only restaurant above New Orleans Square. If you’ve ever looked up at the balcony over Cafe Orleans you might have caught a glimpse of people dining from above or just watching the crowds go by. That is the main dining area of this secret place. Above is elegance, sophistication, and a dining experience that truly reflects the Disney standards of guest service. And while it is members-only if you are in the know (meaning you know someone with membership), you can eat there, too! Standing at the new entrance to Club 33. Craig’s Favorite: How cool it all is! That’s how I was able to go each of the times I went. It was recently revamped inn 2014 and I haven’t been back since the refurbishment, so this was a real treat. It was my friend Andrea’s birthday and her husband John asked if I’d like to come to help her celebrate. Of course I said, “Yes!” Not only is Andrea one of my closest and long-time friends, but it’s Club 33! The new entrance is a little bit down the street. The old door is still there, but the new door leads into a small reception area and an interior courtyard where they served us “lavender water” while we waited to go up. They have a nice spiral staircase that leads up to the dining area, but there is an elevator for if you’d prefer. It’s not as kitchy as the old elevator with the sliding gate, but probably rated a lot safer. Still I like the old one better. The food if possible is even more scrumptious than before. Definitely a five-star rated menu with delicious plating and even better taste. There are great options for every palate and I’m sure they accommodate different allergy sensitivities as well. It’s now a prix fixe menu with options for each of the four courses. The opening appetizer was a choice among Eggplant Roulade, Smoked Duck Breast, Wild Blue Crab Cake, and Southern Fried Quail. I had the crab cake and it was delicious. The next was a salad / soup course with a choice between a Signature Green Salad and the Delta Summer Corn Soup. I had the salad but should have got the soup. The soup was so fun as they assembled it at the table! They bring a bowl filled with ingredients and then pour the soup on top. There were seven different entrees including Chicken Schnitzel, Vegetable Tart, Seared Fish of the Day (a trout that looked more like salmon or arctic char), Sauteed Blue Shrimp, Angus Filet Mignon, “Steak Salad” New York, and Mountain Lamb Pasta. I got the pasta which was delicious. The pasta itself sat in a light broth that must have been made from the lamb itself. But the Chicken Schnitzel looked amazing. All of it did to be honest. Peach Upside-Down Cake with Pecan Brittle and House Churned Vanilla Ice Cream – YUM! Finally, dessert was served. Let me tell you, that must have been the best part. As good as the food was, the dessert was just stellar. I had the Peach Upside-Down Cake and it was soft, moist, sweet, and delicious. The pecan brittle at the bottom was perfect and the house churned ice cream was just the right amount. The chocolate opera cake was also good, but had to go with the Southern-inspired peach dish. The Meyer Lemon Bar was not like a traditional lemon bar – it was better. More like a lemon pie it was tart, sweet, smooth, creamy, and cool all at the same time. Just so good. How can you NOT walk away with souvenirs from Club 33? Of course, I couldn’t go away without a souvenir! I walked away with a pin, an ornament featuring the old door, and a keychain that marked the 50th anniversary of Club 33. They had other items like golf balls, bottle stoppers, paper weights, and purses and a beautiful Cinderella Club 33 pin but it was only for members. In fact, that was something new. They had a selection of souvenirs marked “Members Only.” I was fine with it, just being so glad to get to go here. They also had a special salon just for members that was down the hall, away from the main dining room. Overall, it was an amazing experience and even better that I got to share in it with good friends. Wow, I am so jealous! I was lucky enough to go once about 10 years ago on the day before Thanksgiving. I will never forget that day. Thank you for sharing. I had no idea about the renovation. Was much of the dining area changed? Interestingly, no. The main dining area was largely the same as it was before. But they added a new lounge, a new entrance, and a new elevator. But the dining area still has the same charm. I saw this restaurant in one of the Disney Social Mom’s instagram story and for the life of me couldn’t figure out where she was! Such an awesome look into a hidden part of Disney. Thanks for sharing! Next Next post: How Close Will Marvel Netflix Match the Comics?